Most people know this international survival term as “Save Our Ship.” Others claim it has religious origins, referring to the acronym as “Save Our Souls.” Nowadays, the younger generation relates this outdated call for help to the iconic Batman signal over Gotham City. Kidding aside and regardless of what you know about SOS signals, it’s critical to understand how to perform the distress call, as it could one day save your life. What is SOS Signal Lighting? SOS refers to a distinct Morse Code pattern: three short sounds, three long sounds followed by three short sounds (dot-dot-dot, dash-dash-dash, dot-dot-dot; or . . . - - - . . .). In International Morse Code, three dots are used to form the letter ‘S’ and three dashes are used to form the letter ‘O’. This is where the SOS acronym came from, though the letters – individually or collectively – do not symbolize words or phrases. When administering multiple SOS signals, it is important to pause after the last set of short sounds to indicate the completion of the message. SOS distress signals were widely used between 1905 and 1930, due to European radio regulations that enforced the practice. International military groups eventually adopted the signal, as an effective and versatile approach to notifying naval ships about dangers at sea. The call for help slowly lost its popularity, as newer distress signals were introduced. The London International Convention on Safety of Life at Sea launched the TTT Morse Code signal to simplify the call. As audio-based communication started to take off, other signals, such as “Mayday,” were used. •	Light or Mirror: This is the most straightforward way to flash SOS. Simply flash the light, based on the dot-dash-dot pattern at a visible surface. •	Whistle or Horn: Like using a light or mirror, except with sound. •	Tapping: Like using a whistle or horn, but more discreet. Instead of long sounds, slow taps are used. •	Blinking: This is useful in situations wherein one is being taken for hostage or is unable to directly convey a call for help. The dash codes are symbolized by a long blink. •	Fire: Unlike using a light, SOS configurations for fire are different. Three fires, either in a straight line or in a triangular formation, with roughly 100 feet of space between each point is applied when calling for help in far-flung, inaccessible areas. •	Firearms: Three consecutive gunshots can be used as a distress signal – mostly applies to hunters. The type of lights you use to flash the SOS signal determines its reach and effectiveness. Ideally, a powerful luminary with a spotlight beam configuration is recommended, as the beam pattern can reach far distances. In emergency situations, such distress calls could be performed hundreds or thousands of times before they are picked up and acknowledged by people. To perform multiple SOS signals efficiently, one needs a light with rapid toggling features, like LEDs. 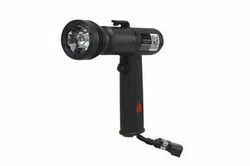 Taking the above requirements into consideration, it would be possible to conclude that rugged LED flashlights or handheld LED spotlights are the best options for SOS notifications.